I don't pretend to be a critic. The sole influence behind my reviews is simply did I or did I not enjoy the book? I read for pleasure, to unwind at the end of a long day, to lose myself from the cares and worries and weight of responsibility I face as a parent and provider. Upon occasion, when I encounter a book that doesn't thrill me, I try to tell why or why not, focusing on the specific reasons the book didn't work for me. It is easier to write an unfavorable review, by the way, then a favorable one. When a book works, it works, and you get to the end without noticing too much. When it doesn't work, by the time I get to the end, I have a whole mental list of reasons why. When I put down Ken Rand's Fairy BewHaHa at the Lucky Nickel Saloon, I didn't have much to say. In light of what I expressed above, that's a good thing. I've encountered Rand before, though such meetings have been few and far between. If the world were a more fair place that rewarded talent rather than marketability, Rand would be a household name. Alas, the world's not fair however, as my young son consistently reminds me. Something that has always struck me about Rand's work is the unmistakable whimsical quality of his tales. Tall tales, almost, with characters larger than life. Even his science fiction stories are more fantasy at heart. Rand writes about people, and with a wry humor that has the knack of making even the most absurd seem feasible. His writing is infused with a sense of hope, an unmistakable optimism that, in the end, it really will be all okay. 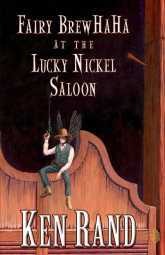 The Lucky Nickel, a saloon in the wild (and in this case) fantastic west, suddenly find itself invaded by a rowdy group of fairies, seeking gold to replenish that which was lost by their king. The saloon regulars find themselves squeezed beneath a magic piano, watching helplessly, but not hopelessly, as the fairies tear up the joint. Mick, Tom Dooley, Banky and Casper, along with a mermaid, circus strong man, and newspaper reporter, abruptly find themselves prisoners in Mick's saloon, while the fairy folk party and plot robbery. Various attempts at escape and mediation occur, with results that are usually as unexpected as they are humorous. I'll the first one to admit I don't much care for humor for the sake of humor, especially silly humor, like that one might find in The Hitchhikers Guide to the Galaxy for example. But Rand isn't writing humor, he's writing a story that's humorous. To me, that's a discernable distinction. Oh, it's not perfect. The vernacular can be sort of tiring sometimes, though for the most part Rand strikes a good balance between local speak and readable dialog. He plays some name games that got old as well, but not so old that they made the whole story wrinkle. If a whimsical, humorous fantasy in a western setting sounds interesting to you, look no further. You'll chuckle more than a few times, root for the right side, and end up entertained and feeling a bit lighter for a while.